August 13, 2013 - The Department of Justice, six state attorneys general and the District of Columbia, filed a lawsuit in U.S. District Court in Washington, D.C., to block the proposed merger of American Airlines and US Airways. Those attorneys general participating in the lawsuit are Texas, from American’s home state; Arizona, from US Airways’ home state; Pennsylvania, home to one of US Airways’ largest hubs; Florida; Tennessee; and Virginia and Washington, D.C. where both airlines operate. Assistant Attorney General Bill Baer said “We filed the lawsuit today because we determined that the merger which would create the world’s largest airline and leave just three legacy carriers remaining in the U.S. would substantially lessen competition for commercial air travel throughout the United States. Importantly, neither airline needs this merger to succeed. We simply cannot approve a merger that would result in U.S. consumers paying higher fares, higher fees and receiving less service”. AMR Corporation the parent company of American Airlines and US Airways Group, Inc. announced that they intend to mount a vigorous and strong defense to the U.S. Department of Justice's ("DOJ") effort to block their proposed merger. "We believe that the DOJ is wrong in its assessment of our merger. Integrating the complementary networks of American and US Airways to benefit passengers is the motivation for bringing these airlines together. Blocking this pro-competitive merger will deny customers access to a broader airline network that gives them more choices. "Further, this merger provides the best outcome for AMR's restructuring. The widespread support from the employees and financial stakeholders of both airlines underscores the fact that this is the best path forward for both airlines and the customers and communities we serve. We will mount a vigorous defense and pursue all legal options in order to achieve this merger and deliver the benefits of the new American to our customers and communities as soon as possible." Baer further sated “Americans spent more than $70 billion flying around the country last year. Increases in the price of airline tickets, checked bags or flight change fees resulting from this merger would result in hundreds of millions of dollars of harm to American consumers. If this merger were to go forward, consumers will lose the benefit of head-to-head competition between US Airways and American on thousands of airline routes across the country in cities big and small. They will pay more for less service because the remaining three legacy carriers United, Delta and the new American – will have very little incentive to compete on price. Indeed, as our complaint shows, the management of US Airways, which will run the new airline, sees consolidation as a vehicle to reduce competition between the airlines and raise fees and fares. “Here is one powerful example. Today, US Airways competes vigorously by offering discounts of up to 40 percent if a consumer takes its one stop instead of another airline’s nonstop route. This means that if you need to catch a flight at the last minute for any reason celebration or emergency you will find it is 40 percent cheaper to take US Airways’ connecting service than the non-stop fare offered by American, Delta and United. The big three airlines American, Delta and United don’t like this aggressive price cutting by US Airways. “For example, for round-trip flights leaving on August 13 and returning on August 14 from Miami to Cincinnati, you can see the benefits of US Airways’ discount program. American is the only airline on this route to offer nonstop service, charging $740. Delta and United don’t have offer competition since they both charge more for their connecting service than American charges for nonstop service. In this instance, a consumer who bought a US Airways one-stop ticket would save $269 compared to American’s nonstop service. “You can see the benefits of competition between US Airways and American on hundreds of other flights. For example, on round-trip flights leaving on August 13 and returning on August 14 from New York to Houston, US Airways’ one stop fare is about $870 cheaper than the other legacy carriers’ nonstop flights, and even beats JetBlue and AirTran by more than $300. “Although Southwest doesn’t participate in the standard online travel sites, a cross-check against the Southwest website for the same dates demonstrates that US Airways also beats Southwest’s $887 nonstop fare by more than $300. If this merger happens, US Airways’ aggressive discounting called Advantage Fares – will disappear. As a bigger airline with many more hubs, there will be no incentive for the merged company to offer any of the discounts I just described, resulting in higher prices, less choice and fewer services for the more than two million travelers who today benefit from the program. How do we know it? We know this from the internal analyses and the planning documents put together by American in considering the likely effects of this merger. “The elimination of the Advantage Fares program is just one example. If the merger goes forward, consumers can also expect to pay higher fees for things like checked bags, flight changes, more legroom and frequent flyer benefits. Today, American does not charge if you redeem frequent flyer miles. US Airways charges an average of $40. If the merger is allowed, US Airways is planning to take this frequent flyer benefit away and make American’s frequent flyers pay redemption fees. By eliminating this competitive distinction between American and US Airways, the new airline generates an additional $120 million in revenue. But you pay the price. “Consumers will also pay more on routes where US Airways and American today offer competing nonstop service. We know from prior mergers that elimination of head-to-head competition on nonstop routes results in substantial price increases for consumers. Expect similar fare increases if this merger is allowed. For example, US Airways and American offer competing nonstop service between Charlotte, North Carolina and Dallas-Ft. Worth. Consumers will likely pay more than $3 million more per year for travel on that route alone. “You don’t need to go far from this very city to see another worrisome effect from the proposed merger. Across the Potomac River, the merged airline would dominate Washington Reagan National Airport, by controlling 69 percent of the take-off and landing slots at DCA. And, it would have a monopoly on 63 percent of the nonstop routes out of Reagan National. By allowing one airline to control that many slots, the merger will prevent other airlines, including low-fare carriers like JetBlue and Southwest from competing at Reagan National. It would face little or NO competition. Indeed, this would get worse. Recently JetBlue started service from Reagan National to Boston, competing with US Airways, and fares dropped by more than 30 percent saving consumers about $50 million a year. Similarly, consumers saved about $14 million in lower fares between Tampa and Reagan National after JetBlue started competing against US Airways. But and this is important half of JetBlue’s slots at Reagan National are leased from American. If this deal is allowed, new American can terminate that lease and JetBlue’s ability to compete will be severely diminished. Consumers will pay the price. Blocking the merger will preserve current competition and service at Reagan National airport, including flights that US Airways currently offers to large and small communities around the country. The complaint also describes other ways in which consumers are at risk if we allow this deal to further reduce the number of competitors in this industry. You do not need to take my word for this. High level executives at US Airways have talked about how consolidation allows for capacity reductions that “enable” fare increases. One US Airways executive recently stated that this merger is “the last major piece needed to fully rationalize the industry.” In the airline business the word “rationalize” is a code word for less competition, higher costs for consumers and fewer choices. 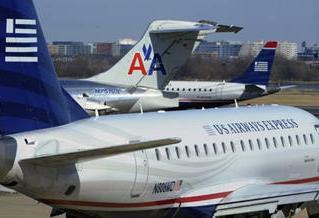 Both US Airways and American have publicly stated that they can do well without this merger. American has used the bankruptcy process to lower its costs and revitalize its fleet. It has repeatedly said that it can thrive as a standalone competitor. Just this January, American’s management presented plans that would increase the destinations and frequency of its flights in the U.S., allowing it to compete independently and vigorously with plans to grow. And, executives of US Airways agree about American’s ability to make it on its own. They have noted that American will be stronger post-bankruptcy and that “[t]here is NO question” about American’s ability “to survive on a standalone basis.” US Airways also has said that US Airways itself does not need the merger that it can thrive as a standalone firm. The lawsuit we filed today to block this deal gives consumers the best possible chance for continued competition in an important industry that they have come to rely upon. Allied Pilots Association (APA) President Capt. Keith Wilson said “Approving the merger is in the best interests of all concerned. We are disappointed that the U.S. Department of Justice has challenged the merger and look forward to the opportunity to highlight the merger’s many benefits. The pilots of American Airlines remain fully committed to merging with US Airways, which will provide for a more secure future for the 100,000 men and women who work for the two airlines,” Wilson said. “As for the notion that the merger would be anti-competitive, the two airlines’ route structures are highly complementary with very little overlap. Combining the two carriers would significantly expand the choice of travel destinations available to consumers.